This bath helps relax tense, sore muscles, yet doesn’t leave you smelling of a medicinal vapor rub. The aroma will soothe frayed nerves, but won’t lull you to sleep. It’s useful to relieve soreness and aches and pains. It also smells fantastic and is just the thing to use next time you feel a little achy and have a stuffy nose from a cold! 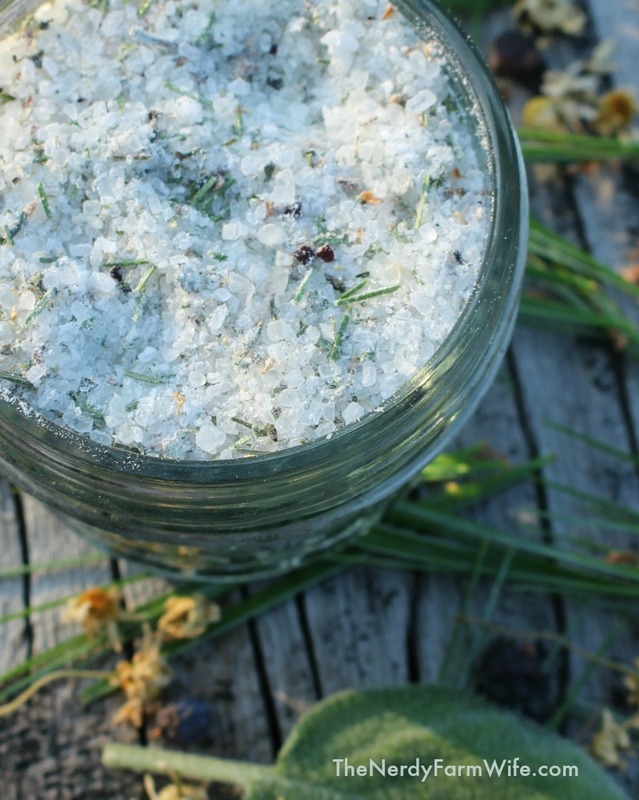 This wonderful recipe comes straight out of the first unit of beginning online herbal class at the Herbal Academy and I couldn’t wait to share it with you today. I had all of these ingredients on hand, or growing in my yard and garden, but you can also find dried herbs at Mountain Rose Herbs or Amazon. Epsom salts and baking soda can be found in most grocery or drug stores. Place the dry ingredients in the center of the cloth and add the drops of essential oil. Take up the corners of the cloth and tie with a ribbon or string. Tie your herb bag over the faucet to allow warm water to run through, releasing the medicinal properties and filling the air with aromatherapy. Relax and enjoy! Variation: Before tying up in a cloth – gather, then air dry the herbs for two or three days, spread out in a single layer on a clean dishcloth. Once dry, whirl the herbs together in a mini food processor with about 1/4 cup coarse sea salt until finely ground, then stir the resulting fragrant mixture into the baking soda and Epsom salts. Even though the herbs are a finer texture, you still want to tie them up into a bag, so the herb specks won’t make a mess in your tub. Tagged bath, chamomile, juniper, peppermint, pine, sage, soak, sore muscles. Bookmark the permalink. Are the juniper berries crushed or ground up? Hi Shawn! You can crush or grind them up. My little food processor didn’t quite grind them fully, so little chunks were still scattered in the blend. Since you use a bath bag, it’s not a problem for bathtub drains if the berries aren’t ground completely. found you on Pinterest. 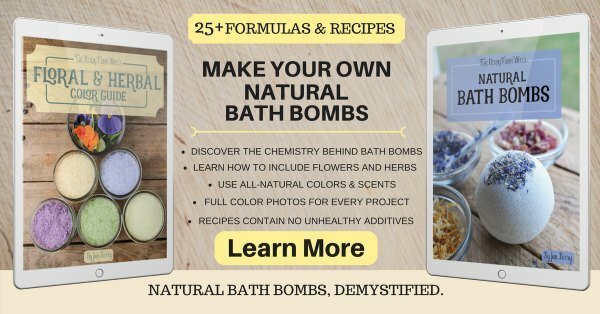 Just learning about homemade soap, although I have been making the laundry detergent for years. New follower! Is this recipe for a one time use, or is it suppose to be enough for several bathings? Also, if you were giving this as a gift, how would you incorporate the essential oils, since it recommends adding them at time of use? Hi Lauren! It depends on how much you want to use at a time/how deep a bath you draw. I like using the full amount, but half as much might be ideal for others. You go ahead and put the essential oils in with the other herbs, not right before using. Sorry if that wasn’t clear! Is there a specific type of pine needles that should be used? I have pine trees in my yard, not sure of the specific type, just know they are pine. Could I use the pine needles from them? Thank you for your reply to my questions. And thank you for the links to the other articles. I do believe the pines I have in my yard are white pine but have not actually taken the time, yet, to go examine them. They are definitely not any of the three poison types. 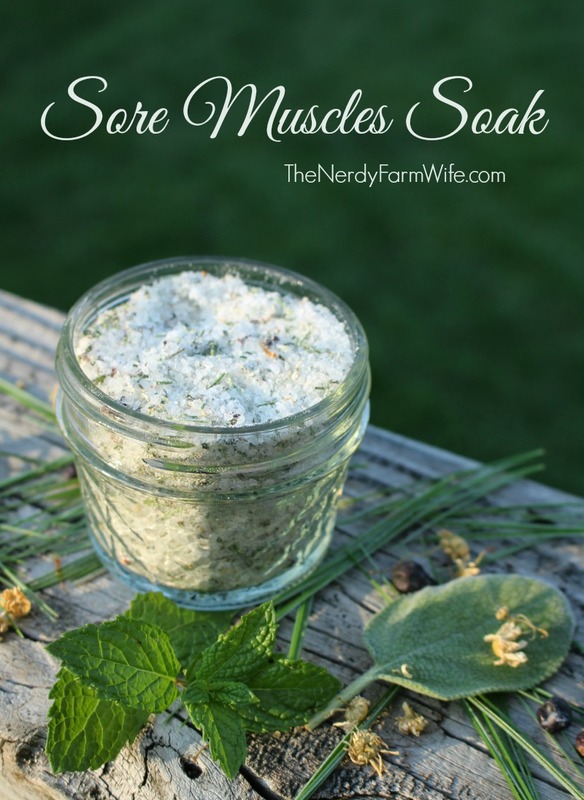 And since you think it would be ok to leave out the juniper berries, I will make the sore muscle soak and try it out this weekend. Also, I have all other ingredients but juniper berries, is there something I can substitute for them? Hi MSellers! There are so many other good things in this recipe, that I think you could leave them out and still have an effective soak. I don’t understand the next step after putting everything in the cloth, tying the cloth and letting warm water run over the cloth. You then said you spread out I guess the cloth with everything in it and let it dry, then you whirled the herbs in a food processor with epsom salt and baking soda. Then what is next, tie it back up and put it in the water? A little more clarity please. Thanks for the recipe. Hi Donna, I see what you mean – I mixed up the order a bit! Thanks for letting me know! You can either gather up the herbs whole, or whirl them in a food processor for a finer texture. Then tied them up and let the warm water run over them for your bath. Then you’re done! Sorry about the mix-up. I’ll go in and retype that up in a short bit so it’s more clarified. Love your website; love the information. Excellent presentation. Buena suerte. GodSpeed. Thank you for the kind words Helaine! Hi, just a quick question, juniper berries, pine needles, sage leave, peppermint leaves, where or what kind of store, should I be looking for, a Health Food Store, Vitamin Store. Have been searching, nothing in my area, of course.